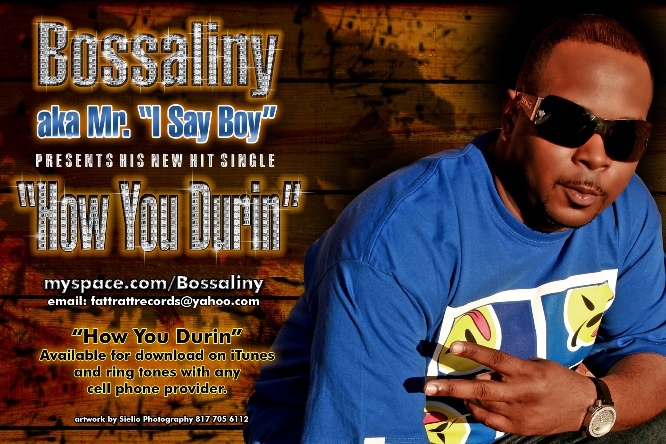 Fatt Ratt Records brand new SUPER SINGLE entitled "How You Durin" by Bossaliny aka Mr. "I Say Boy". This song is quickly becoming a radio and club favorite around Texas and soon to be across the globe! All versions are included for the Radio/Club/Remix DJ's. Feedback Appreciated. I was bumpin this one back in February. Spun it pre-mixed for a basketball game that I announced for. It started off kinda slow, cuz people had never heard it. But it gained momentum, and I had lots of folks ask about it after the game. Good Look! !